Telangana (VSK). 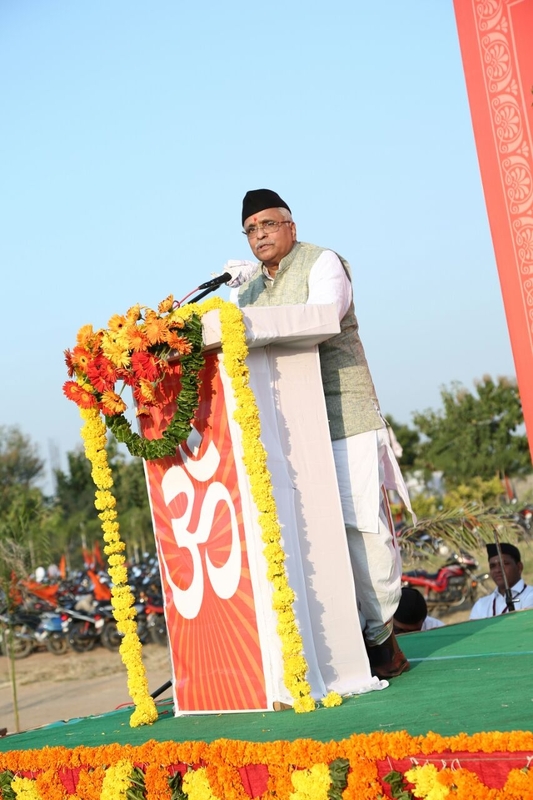 Sangh work has values of Hindutva as its foundation. Hindu values and view of life viz Hindutva is not opposed to anyone, but it is an integrating force said Suresh Bhayyaji Joshi, Sarkaryavah of Rashtriya Swayamsevak Sangh. 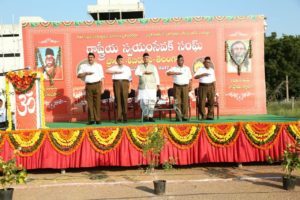 He was speaking in the valedictory program of the Prant karyakarta shivir held in Karimnagar, Telangana, on 4th and 5th Nov 2017. 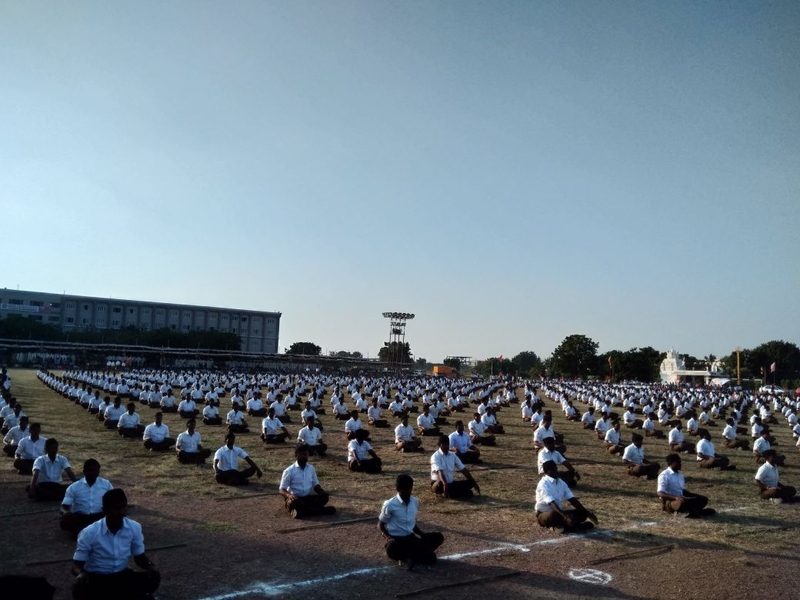 Over 1657 karyakartas from all districts of the state participated in this camp. 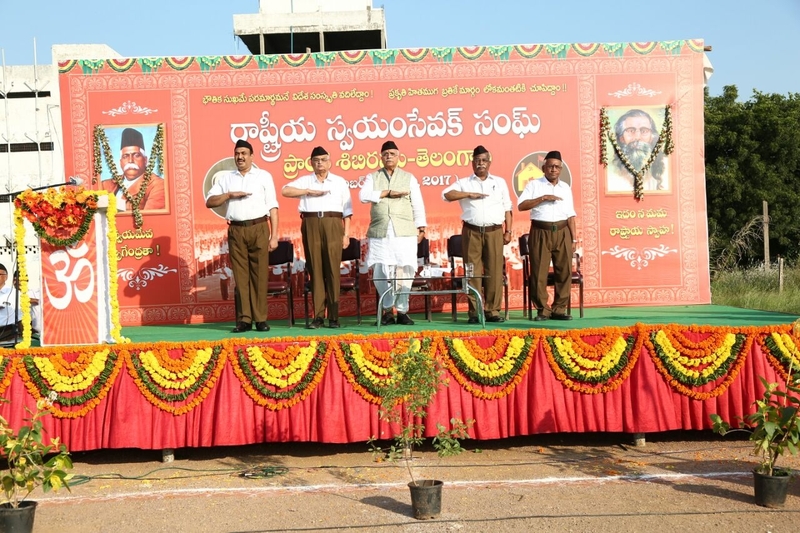 On the dias are Sarkaryavah Bhayyaji Joshi, Dakshin Madhya Pradesh Kshetra Sanghachalak Nagaraj Ji, Prant Sanghachalak Pyata Venkateswara Rao Ji and Karimnagar Nagar Sanghachalak Dr. Ramanacharya Ji. Hindutva is the integrating force of the Rashtra. It unites people of different faiths and it accommodates everyone. It does not discriminate whether one goes to temple or not, or believes in rituals or not. We can witness this from Kashmir to Kanyakumari. When we say we are Hindu, it is the name of the great and hoary culture of those that lived beyond the Sindhu. The importance of Hindu thought and values are eternal. We always say “Sarve Bhavantu Sukhinah”. We believe that “The One” manifests itself into various forms. Our Rishis went abroad, but they never ventured out with arms and ammunitions. They always stepped out to give knowledge to the world. They taught human values, they were never aggressive. But Bharat was constantly attacked by forces who were narrow minded including some of the Semitic religions. We believe that our body is made by “Pancha Mahabhutas”. Therefore we identify ourselves with them. We nourish and respect nature with a “Pujya Bhaav”. We worship trees and plants for example Ashwatha, Peepal and Tulsi. We worship rivers and perform aarti to it, a unique ritual in the world. These values are practiced by Hindus all over the world. At the same time today we see lakes being polluted and large scale deforestation due to human selfishness. Currently, we have only 11 percent of forest, but to survive as a race we require 30 percent forests. 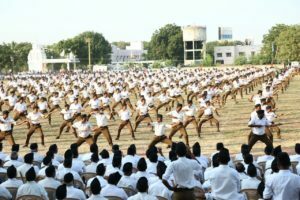 Swayamsevaks are doing their part along with the Government in some states. In Madhya Pradesh and Maharashtra, 11 crores saplings were planted in few days due to involvement of government and people. Jaggi Vasudev Ji is running a campaign to ‘Save Rivers’ and Swayamsevaks are supporting it. We must not only love but also practice the values of our ancestors. 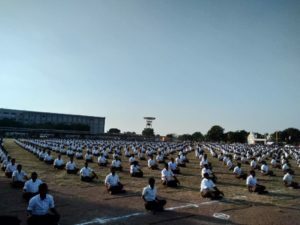 Swami Vivekananda said this is “Punyabhumi”, “Mokshabhumi”. We must protect it. Some people have been talking ill of the Army. Such people must be negated. Our Army protects our borders. And the least we can do is to respect the Armed forces. In the last few months over 100 terrorists were killed in Jammu and Kashmir. We can imagine the terror they would have inflicted in the country. The villagers of our borders are also vigilant. We appeal to the central and state governments to take care of such border villages. In the last few months we have seen that Myanmar Muslims infiltrated into Jammu and Kashmir and are also staying in Hyderabad. Myanmar Muslims are alleged to have killed Buddhists and Hindus in Myanmar. Some argue that we must take care of them as a humanitarian gesture. But we must remember that the security of the country comes first. No country allows people to overstay but in Bharat we see infiltrators from Bangladesh and now Myanmar. From the reports we have, it seems that Rohingya Muslims have not come here only as refugees but with mal-intention. There is a continuous aggression on people standing for Hindu values in Kerala, West Bengal and Tamil Nadu. In the last two years, over 25 karyakartas of Sangh were killed in Kerala. In democracy there should be freedom to differ in opinions but the communists seem to believe in exterminating those who differ with them. Today’s problem of Kerala can become problem of Telangana too. In West Bengal, the government is silent on the attacks on Hindu temples. Police stations have been looted and public institutions vandalised. These events are a serious matter of concern to the Hindu society. We must also look inwards to solve the problems in Hindu society. Hindu believes in – “Advaishta Sarva Bhutanaam” and ‘Isha Vasyam Idam Sarvam’. Then how come we called some people as untouchables just because they were born in a particular caste. We must work towards removing these differences. There are some people who are working to increase the gap between people of various castes. Some politicians are also doing this. We must identify these forces who build animosity and work to nullify their impact. 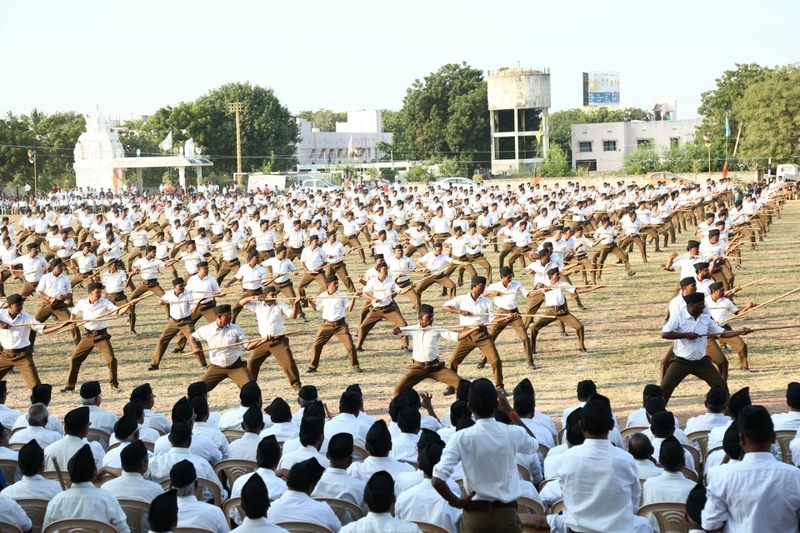 Sangh has been working towards building a strong Hindu society and thereby build a strong Bharat. I invite all those who have come to view this program in such large numbers to come and play a part in this divine work.